Having a flair for mathematics? There are students who cannot sleep without being able to solve a mathematical puzzle. They feel the other subjects they study are boring if there is no mathematical problems to solve. Their brains become dull when they do not get a question with a little bit of maths in it!! The inquisitiveness to solve and the passion for a subject are signs that they are in love with the subject. But when it comes to careers or job profile then you are not sure which job would suit you better. 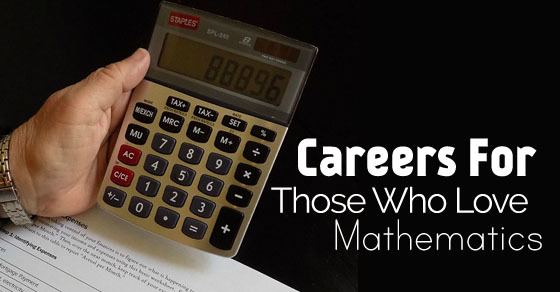 Let’s see the categories of job profiles that are in the market and especially, best careers for math lovers. As the title says, working with financial information and providing that information to the company or client or customers. Their work is mostly on spreadsheets, making reports and then presenting them. There are various type of financial analysists like security analyst, Investment analysts who work for Insurance companies, Mutual Funds, Investment banks, etc. These analyst help organisations who have money to invest and also help organisations to price and sell their products. In a higher level they also can analyse the organisations ability to repay their debt. In fact they can also perform cost analysis and be responsible for budgeting. Besides that having knowledge on finance related software program that is trending, good communication skill and good presentation skills are also required. If you have flair for the subject and have the aptitude to teach children, then taking up a profile of being mathematics teacher is best. For this you need to have good understanding of the subject, language proficiency, able to make children understand and patience. Depending on the grade levels you want to take you have to be proficient in those skills. For example first grade needs to focus on addition, subtractions, whole numbers, geometric shapes, etc. while high school graders focus on geometry, algebra, functions, statistics and probability. For being a good teacher you need to plan lesson in advance to teach, employ different methods like discussions, demonstrations, and field trips and know the educational equipments like materials, learning aids, books. Besides you would need to evaluate the students’ progress to see if the standards are met. All new discoveries are results of conducting research work. They carry out experiments and investigations to broaden scientific knowledge that covers areas from life science to industries. It could mean that work would revolve around developing of new products to breakthrough in health sector. Based on the project assigned and your position, a typical day would comprise of conducting experiments, analysing research data, working with other research team, applying for grants. Most of the time, these work are conducted in laboratories, hospitals, defence companies, universities where area of subject are physical sciences like chemistry, physics, materials science, geo science, earth sciences like geology, meteorology, neuroscience, plant sciences, industrial science like biotechnology, food, petrochemicals, medical research like cancer studies, vaccine studies, stem cell research. You may also need to attend conferences, workshops. Additionally being a good communicator and being accurate is also advantageous. This job profile is concerned with design and construction of transport system like roads, airports, harbours, gas and water supply system like systems, dams, bridges, sewerage systems, buildings, towers. The data they collect is used to analyse and then decide on the designs for control systems for vehicular movement, environmental systems for sewage, developing sites for industrial, commercial or residential use. Their analysis involves the testing of surface soils, subterranean soils, construction materials so that the structures are safe, economic and environmental friendly. As this field is vast, there are various categories like construction engineers, municipal engineers, structural engineers, transport engineers, highway engineers, and water supply distribution engineers. They get opportunity to work in private sectors as project managers, construction contractors, consulting engineers or in government offices which has wide range of sections. In depth knowledge of the testing practices and building codes are important requirements along with problem-solving skills and good communication skills. A cost estimator helps management in formulating estimates for a construction project, manufacturing product, and bidding. The job profile requires to read, analyse documents, blueprints, in order to calculate the material cost, time for execution, labour costs. Before the project is initiated they need to analyse the cost estimates for the project execution and decide if it is cost effective. Once the project has initiated they project to the management about the changes in schedules and the expenditures. As more and more firms are becoming cost conscious this job profile is demanding job where he/she needs to train others, supervise or co-ordinate work. Knowledge of building and construction along with accounting, economics, engineering, mathematics are required. Being able to read and speak clearly, sense of reasoning could be advantageous. They use their analytical and creative skills to examine the operational systems and procedures to make improvements. There are various software, mathematical modelling and analytical procedures utilized for analysis of information to allow organisation to make strategic decisions. This job profile requires collecting and analysing data pertaining to organisations operations, supporting management for changes using data gathered using mathematical programming and statistical techniques, identifying innovative solutions and testing those solutions to solve the problems, forecasting, resource allocation, schedules personnel required, develop methods for inventory control. Communications skill is essential especially explaining to the customers or clients in non-technical language. Opportunities for this category spreads out to all organisation mainly manufacturers, military, airline. This job profile are experts in the planning and construction of aircrafts and space crafts. Their area of work could relate to developing control systems for jet fighters, analysing new materials that could be used of construction of space craft, creating and producing helicopters, military aircraft and commercial aircraft. These engineers conduct research on materials that could be suitable for use in spacecraft manufacturing and even the structural integrity. They also could be involved in designing control panels for fighter aircrafts wherein they document results of test flights. Designing propulsion systems as well computer systems for space exploration is also part of their discipline. As the field is vast, those professionals involved in dealing with space craft are called astronautical engineers while those dealing with air craft are called aeronautical engineers. As the word ecology depicts, this job profile are concerned with the relationship between plants, animals and environment. This interdisciplinary field of work has connection between biology, geography and earth science. They conduct researches on how organisms living in their habitat interact with other species and environment, how nature works within a particular geographical location, whether removal of particular species from its location disturbs the food cycle, etc. They have to do field work to collect data and analyse. Collected information is crucial to define the impacts of environmental degradation and propose plans for sustainability. They communicate their results to clients, policy makers along with geographical information system to recommend environmental restoration projects, schedules and budgets. The job profile requires one to measure scientific occurrences on earth namely earthquakes, tsunamis, prediction of hurricanes, temperature outlooks, the location of minerals and oil. Using mathematical models, research data are converted to equations and calculations that gives more insight of the earths structure, magnetic and electrical field behaviour, assess water table, mineral and oil veins, gas, diamonds, finding safe place for dams, calculate probable environmental hazards, etc. The person needs to be proficient in maths, geology and physics. Besides having ability of problem solving, good communication, problem solver, creative thinker, ability to work independently are added advantages. A physicist is a scientist who understands the interaction of matter and energy across the universe and interested in ultimate causes of the phenomena. They interpret the information in the form of mathematical equations. As physics is a vast field there are various other specializations like particle physics, astrophysics, modern physics, electricity and magnetism, nuclear physics, optics, thermodynamics, quantum physics, acoustic physics that can be reviewed as well. Besides having interest does not limit one to lab or teaching roles. There are roles as medical physicist or nuclear medical physicist. Application of physics to research draws attention to environmental geophysics and gravitation. But on a larger scale, physicists would be more involved with designing the experiments for a purpose, implementing them using specified scientific methods and bringing out conclusions for the advancement of industry. You may be familiar with this subject since secondary level as it is part of social science which relates to the distribution and consumption of goods and services. They provide specialist advice to the concerned audience using economic theories from the data and information collected through considerable amount of research. Overall, they implicate the findings as forecasts and convert them to recommendations for improvements to businesses, organizations and governmental agencies. Having good written and presentation skills, good management skills, interest in economics, ability to extract information and good IT skills are some of the attributes required. The work assignments are innumerable where it could range from analyzing job prospects to performance of companies, researching on global economies to preparing notes for government officials, advising government to bringing out implications of exchange rates. The world is running on various businesses that need to be updated on the market trends. Market trends are nothing but needs of the customers or the way the customers ‘would like’ their products or services. Market researchers are mostly consultants who collect, analyse and present data to their clients who could be industries and companies. The research is either performed qualitative where opinions are displayed or quantitative wherein data is converted as percentages to show results. The main tasks relate to meeting clients, briefing interviews, conducting surveys –quantitative or qualitative, analysing and interpreting data collected, writing reports, advising clients, monitoring and managing budgets. This job profile is involved in projects from the concept, design, to implementation, testing and handing over stage. Their job are mostly linked with other disciplines like architects, mechanical engineers, customer service, technicians, marketing. Their tasks pertains to identifying the customer’s needs, designing them as per specifications and costs, communicating with other clients, co-ordination with other manufacturers, conducting and interpreting tests, servicing and maintenance, monitoring, giving presentations. The electrical engineers have opportunity to work in wide range of sectors like transport, manufacturing, industry, construction, power renewal energy, specialist engineering, telecommunications, petrochemical, armed forces, defence related and multinational companies. Having skills like project management or report writing skills allows one to reach a management cadre. Being actuary you would be dealing with business in the insurance industry which is to analyse important data of mortality, sickness, disability, injury, retirement to aid those involved with the insurance. It not only informs but also predicts of future risks. The statistical information gathered from insurance plans, annuity plans, pension plans, contracts, company policies are reviewed and relayed to the concerned for the benefits of those pursuing insurance related issues like disbursements, premiums, and retirement funds. He / She may work for specific company or for different companies. Hence, they are required to be proficient in mathematics so that they are pretty sure about their conclusions on interpretation of their statistical data as they might sometimes be required to testify before public agencies or to resolve an issue. Possessing good analytical skills and research skills, creativity helps to analyse many documents. So you can see studying mathematics helps to land you in any job in the market, and the opportunities and jobs for math lovers are huge. But it should be also noted that mathematically trained people who are excellent in problem-solving and critical thinking skills are the most needed in every field of work. So sharpen your maths and explore the opportunities that are available in plenty.